CHPSO provides members with a safe harbor. Reported medical errors and near misses become patient safety work product, protected from discovery. Members collaborate freely in a privileged confidential environment. CHPSO identifies clinical patterns that cause medical errors; develops and conveys best practices; and shares lessons learned. Members tap into the collective intelligence of patient safety experts and innovators, translating into exponential improvements clinically and economically. CHPSO also works with CHA, the Regional Hospital Associations, government agencies, other PSOs and quality and safety institutes nationwide. Improve patient safety by examining what went wrong and why, share lessons learned, and hear from innovators in a confidential and collaborative environment. CHPSO offers user group meetings, webinars, safe table discussions, and a robust annual meeting. Safe table forums are opportunities for CHPSO members to convene and have an open dialogue about patient safety and quality issues. Frank and transparent discussion are encouraged in this confidential and legally privileged setting. CHPSO offers many complimentary services that help hospitals accelerate patient safety improvements—support for connecting to CHPSO’s data reporting system, root cause analysis critiques, custom research reports, and sample policies and procedures and independent peer review through its partner, AMFPSO. As CHPSO is a not-for-profit, the fee schedule is based upon the cost to provide the service, without the overhead for profits, marketing, etc. Members of the California Hospital Association (CHA) and California’s regional hospital associations may join at no charge, as CHPSO’s expenses are supported by their dues. Out of state entities that are part of a California hospital system that is a CHA member pay $3,000 per year, in recognition of the system’s financial support of CHPSO. Medical group: $3,000 per medical group if that group reports separately from another paying entity (e.g., a hospital). Contact CHPSO for Colorado Hospital Association member pricing. 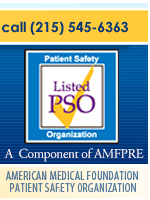 CHPSO has a partnership agreement with the American Medical Foundation Patient Safety Organization (AMFPSO) that allows independent peer review services without the need for an additional hospital – AMFPSO membership fees. AMFPSO is a component of the American Medical Foundation for Peer Review and Education (AMF), a non-profit 501(c)3 organization that was founded in 1987 by the leaders of national medical specialty societies and health care organizations to provide independent peer review and assessment of the quality of medical care of individual physicians, specialty groups and service lines, by a faculty of the foremost medical educators. Peer review fees are limited to individual assistance, as the membership fee is waived for CHPSO members.